That live action Jetsons reboot is proceeding with ABC (US) proceeding with a pilot, to be filmed as a traditional multi-camera sitcom (uh-oh). Robert Zemeckis (Forrest Gump, Back to the Future) will serve as an executive producer, with Family Guy writer Gary Janetti penning the pilot. The new version is actually a put-Pilot meaning if the network does not air it will owe substantial monetary penalties to the studio, Warner Bros. 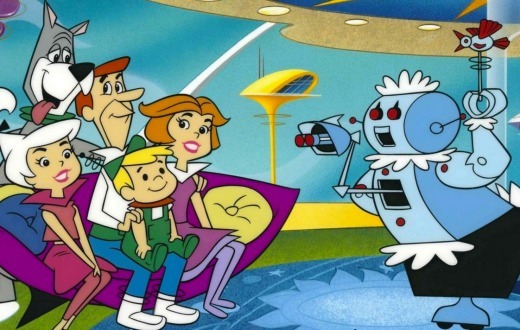 The original Jetsons was set in the year 2062 and ran from just 1962-63. Don’t try to improve on the theme, guys. They don’t make ’em like this anymore. Yeah hopefully with the theme song they’ll keep it if only a little updates, case in point it worked for Hawaii Five-0 keeping they same theme song. Wonder if the Warner Bros planned new animated Jetsons feature film with Conrad Vernon directing is still going ahead then, hopefully this might inspire someone to make the new DC Flintstone comics into a series, it’s very up to date on a social level. A show from the past about the future from a present point of view. Silly idea if you ask me, but i’d love to be proven wrong. Theme by the great Hoyt Curtin – and trumpet solo by Conte Candoli. Both trained as swing band musicians.